So Does This Mean Australopithecines Walked On Their Hands? “Basically they scooted around by grabbing nearby vines with their mouths and pulling their bodies. Almost like a snake. What we used to think were legs were actually big flippers that flapped about in the air, driving them forward. Incredible.” Kirch told reporters that when you think about it, paleontology makes a lot more sense now. FIG. 1. Representation of the amino acid relationships of the minimal pore regions of the voltage-gated ion channel superfamily. This global view of the 143 members of the structurally related ion channel genes highlights seven groups of ion channel families and their membrane topologies. Four-domain channels (CaV and NaV) are shown as blue branches, potassium-selective channels are shown as red branches, cyclic nucleotide-gated channels are shown as magenta branches, and TRP and related channels are shown as green branches. Background colors separate the ion channel proteins into related groups: light blue, CaV and NaV; light green, TRP channels; light red, potassium channels, except KV10–12, which have a cyclic nucleotide binding domain and are more closely related to CNG and HCN channels; light orange, KV10–12 channels and cyclic nucleotide-modulated CNG and HCN channels. Minimal pore regions bounded by the transmembrane segments M1/S5 and M2/S6 were aligned by ClustalX (Thompson et al., 1997) and refined manually. The pore regions of the fourth homologous domain of NaV and CaV channels, the second domain of the two-pore channels (TPC), and the first pore regions of the K2P channels were used to assemble the alignment, and an unrooted consensus tree was built by minimum evolution analysis using PAUP version 4.0b10 software (Swofford, 2003). To confirm the significance of the relationship among the families that comprise the VGL ion channel superfamily, we tested the significance of the amino acid sequence relationships using the HMM searching procedure. 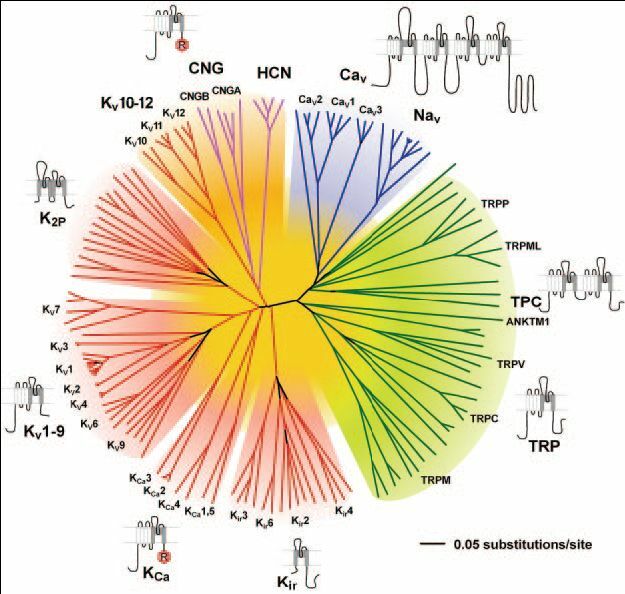 HMM searches of the complete RefSeq database revealed that each ion channel family profile identified another family of voltage-gated-like ion channels as the nearest relative in amino acid sequence of its pore. For example, for the KV channel profile, the nearest neighbor was CNGA1 (HMM e-value of 2.6 103); for the cyclic nucleotide-modulated channel profile, KV11.2 (HMM e-value of 1.5 106); for the TRP channel profile, CaV3.1 (HMM e-value of 1.8 103); and for the NaV/CaV profile, CatSper (HMM e-value of 9.4 106). The e-value is a measure of the number of hits from HMM searches that would be expected by chance; values less than 1.0 indicate a highly significant amino acid sequence relationship to the probe profile (Yu and Catterall, 2004). Fig. 3. Independent, adaptive molecular evolution in the skeletal muscle sodium channel (Nav1.4). Amino acid replacements at sites important in TTX ligation in the P loops of Nav1.4 are found only in TTX-resistant garter snakes and appear uniquely derived. (A) Structure of the-subunit of Nav1.4 showing the 4 domains (DI–DIV), their 6 transmembrane segments (S1–S6), and the linkers that connect segments. The 4 polypeptide chains that link S5 to S6 (bold) form the outer pore of the channel that allows selective permeation of Na ions; however, a number of residues that form the outer pore bind strongly to TTX, which occludes the pore and halts Na movement (see text for further discussion and citations). Approximate location of amino acid substitutions in DIII and DIV P loops (color-coded to species) discussed in text. (B) Phylogeny of Nav1.4 alleles from Thamnophis and relatives based on 2.9 kb of Nav1.4 sequence data (4.3-kb alignment), including the coding regions of all 4 P loops (1.0 kb) and portions of 3 linked introns (1.9 kb). The gene tree closely resembles independent estimates of garter snake phylogeny based on mtDNA (Fig. 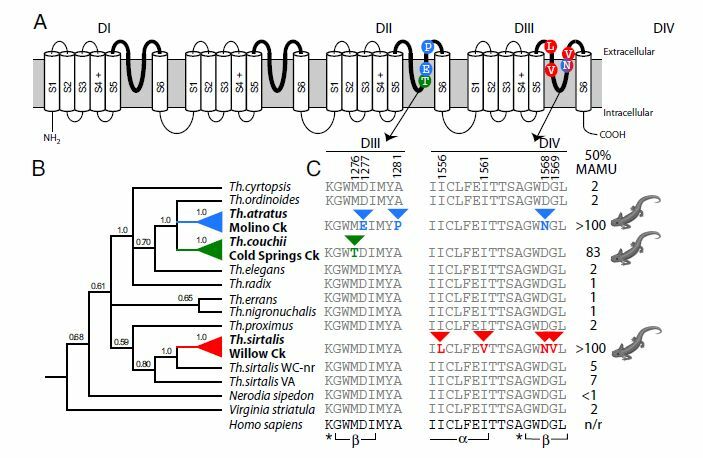 2), and shows that elevated TTX resistance has evolved multiple times in garter snakes. Topology and nodal support values were estimated via Bayesian tree searches; some outgroups were pruned for simplicity; locality information is in Table S1. (C) Measures of whole-animal resistance to TTX (50% MAMU) alongside amino acid sequences of the DIII and DIV P loops (Table S1). Amino acid substitutions (arrows and replacements color-coded to species) occur at critical residues that change the structure and electrostatic environment of the pore and alter TTX binding affinity. Human sequence is given for comparison (M81758), but amino acid positions follow Nav1.4 CDS from T. sirtalis AY851746; structures of the pore labeled below human sequence (*, selectivity filter; , -helix; , -strand).